The easiest way to join and support the BNC is via its website at https://bouldernordic.org/become-a-member/. 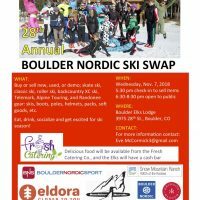 The Annual Ski Swap is coming up and BNC volunteers like to accommodate folks who may want to join the evening of the Swap. However, the truth is that it is far easier for everyone to join online. Thanks for supporting the BNC!